At the wedding of Ken’s (Chow Yun Fat) daughter, Rainbow (Kimmy Tong) and his protégé, Vincent (Shawn Yue), Michael Chan (Andy Lau), warns Mark (Nick Cheung) that someone wants to kill Ken. Suddenly, an explosion goes off at the wedding. The newlyweds go into a coma from a severe concussion. Enraged, Ken swears to get vengeance. A mysterious tycoon, J.C. (Jacky Cheung) invites Michael and Ko Chun to his birthday party. J.C. wants to humiliate Ko at the gambling table; luckily, Ken is smart enough to crack all the tricks along with Michael, Mark and Kitty (Li Yuchun). Realising that his tricks do not work, J.C. drugs Ken unconscious. I’ve caught From Vegas to Macau I and love Nicholas Tse in it; I’ve watched From Vegas to Macau II and find the plot a little disappointing, and I’m catching the third one simply because I’ve watched the previous 2 and this time Andy Lau has a bigger role in it! To be truthful, despite the bad online reviews, I will still recommend fans of Andy Lau and Chow Yun Fatt to catch this movie. Definitely not for the plot, but for the nostalgic nonsense that they do (and sing and say). With the opening resembling a somewhat a marvel comic recap of the past two instalments, the films brings back the original casts as well as introduce new casts like singer Li Yu Chun. Chow Yun Fatt is crazily charming as Ko Chun in “God of Gamblers” and ridiculously funny as Ken Shek. Don’t think plot, just have fun watching them fool around with tech gadgets – real and fake ones, and it is good enough to make you laugh. Mark (Nick Cheung) and Michael Chan (Andy Lau) are the next two reasons why you should watch this film. I love it when they made references to their real life (think marriage and kids) in their reel self. The witty conversations made me shake my head at times wondering if that was even scripted or was it taken out of the NGs where they spouted nonsense. Another classic moment was when they started referring themselves to characters from Jin Yong’s novels, some of them having really acted those characters before (i.e. Andy Lau as Yang Guo etc). They were so ridiculously lame that I got to give them credit for the lameness. Li Yu Chun was a tad stiff in her role, but I guess anyone will appear a greenhorn when acting amidst the veterans of the veterans! Well, I will definitely ignore the budding love triangle between her, Andy Lau and Nick Cheung. Because the whole vibes were definitely OFF. The up side about the film was how Singapore was mentioned to be a place Michael Chan (Andy Lau) was staying, and a lot of scenes were shot in the “Singapore”. However, the house looked more like a makeshift warehouse renovated into a temporary (albeit ultra cozy) apartment. The most disappointing part is perhaps the overuse of special effects, which include the transformer (or some game character) like robots, and several Iron Man moments for Nick Cheung. At least 15minutes (it felt like 30 minutes though) was dedicated to the silly fight between the transformers robots and Ken’s R2-D2 doppelganger robot, Stupido, and Michael’s femme-bot, Skinny. If only it was kept to 5 minutes and allow more screen time for the real fight scenes for the ones who had the skills (say Jacky Heung), it might get another star from me. Chow Yuen Fatt took up three roles in this film and when filming an explosion scene in the jail, he was hung up 12m high (without any double) and even had to be in struggling mode where he kicked off his slippers. Jacky Heung (Long Shi Wu) who had a lot of fight scenes in the film is Charles Heung (Long Wu)’s son in real and reel life. It was his first time acting alongside his dad and he had to film a fight scene for four consecutive days. It is 5th time Jacky Cheung and Andy Lau acted together; 10th time for Andy Lau and Chow Yun Fatt. Jacky Cheung was hesitant to act in this film as his recent roles have all been the villain characters. Korean singer, Psy plays a cameo in this film as a gambling expert. There was a scene where Andy Lau had to fight 10 of his lookalike doubles (robot version of him) and it was said to be the Andy Lau version of Ip Man. Check out From Vegas to Macau III (赌城风云3) Facebook Page! 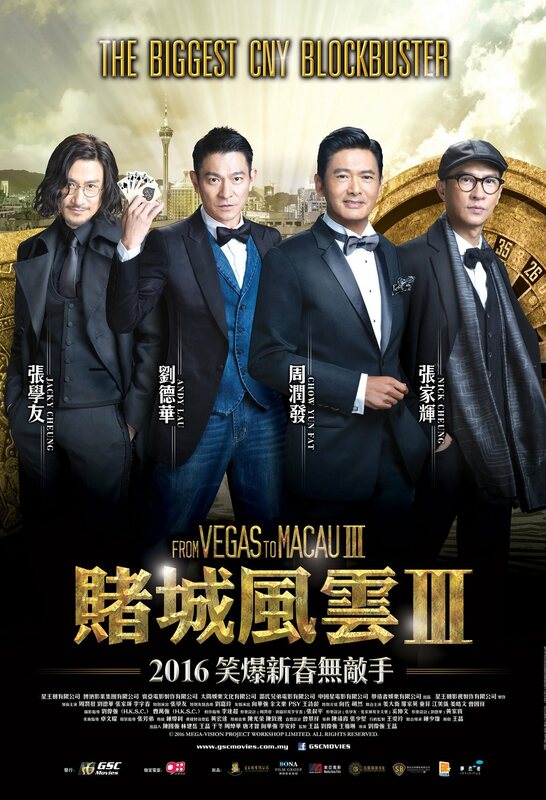 From Vegas to Macau III (赌城风云3) is out in cinemas on 6 February 2016. This looks like a nice, fun movie. And, as I see it is the third part, I’m guessing the series is a success! I’m sure people will love watching this movie! I just see this movie in Singapore and 15mins into the show, I wanted a refund. It is wasting my time and stuck in the cinema. Probably this is the worst show I have watched. The feeling is like a bunch of 50+ men acting like children and computer graphics are totally out of the theme. This sounds interesting. I grew up in Vegas and loved Macau so it’ll be fun to watch just for the setting itself! Looks like a fun movie! Will try to get a hold of this and watch with my husband. Looks fun! i hope they distribute this in my country. the plot really sounds lackluster but I love Andy Lau and chow yun Fat together, so definitely watching! Looks like a movie I would watch! It has an interesting story line, action and good cast. Thanks for sharing the review. I hope it reaches many similar audience. I love Chow Yun Fat and I wonder if we’ll get to see this movie here in the US, even if it’s on Netflix. I would love to see this one! I haven’t seen this movie. But I don’t think this is available here in PH. This is a good watch I think. I watched it during CNY and it was below my expectation. The whole story is bit messy and some part are not logic. Anyway we watched it because of Jacky Cheung, Chow Yun Fatt, Andy Lau and Nick Cheung. Wow.. Another one from Andy Lau though I have not heard about this movie. 3/5 is not a bad rating at all. How I wish this will be shown in the Philippines. I’m familiar with Andy Lau and Chow Yun Fat. I’d like to watch this one. I have seen the first Vegas to Macau film and I did not really like it. I am glad to see Chow Yun Fat but I don’t think I would like to watch this one. Pretty much reminds me of Hangover Trilogy! It somehow so happens that in sequels the awesomeness of original doesn’t continue. Same happened with Hangover as well. This movie looks full of interesting action. From one Casino location to another…I have not watched too many Asian movies but will consider watching this. The robots seems off theme here. It still looks like a nice movie to watch. Sounds like a fun, feel good movie to watch with friends! I only know Chow Yun Fat who has appeared in many Hollywood films. He’s a great actor! I love him.